The Loyola Cubs of Los Angeles (#4 in Los Angeles) travelled south to face the Torrey Pines Falcons at Ed Burke Field for Torrey Pine’s Senior Night. The Falcons recognized 14 seniors Saturday night. Goalie Max McGuire (Fairfield), midfielders Brandon Nahum, Luke Braun, Captain Ara Suhadolnik, Spencer Small, Anthony Vercelli, Brendan Egan (Bucknell), Jake Wheeler and Marc Lefferdink, attack Hunter Smith and Josh Sherman (Ohio Weslyan) and defenders Captain Beau Botkiss, Luke Talman (Babson) and Chase Fanning. However, it was junior attack Aldrick Van der Heyde who lead the way with 4 goals and 3 assists. The first quarter was all Torrey Pines as Van der Heyde scored first off an assist from face-off specialist Spencer Grant. Van der Heyder followed that up when he beat his man for an unassited goal. The next goal was made by freshman Alex Pistorius who cut in front on the goal where Brendan Egan hit him with a nice pass and Pistorius was able to find the back of the net. The final goal of the quarter again was made by Van der Heyde. Brendan Egan led the face break off of a save by goalie Max McGuire. Egan was able to find Van der Heyde who put it away for his 3rd goal of the quarter. 2nd quarter started off like the first quarter ended, however, this time it was Van der Heyde with a pass from behind the goal finding Spencer Small open for a score. Loyola got on the board when Garrett Smith scored a goal on an assist from Emmett Reilly. Torrey Pines ended the half with a goal by Zach Friedland (Georgetown) who made a nice move on his defender and was able to beat the goalie to end the half with the score Torrey Pines 6, Loyola 1. 3rd quarter started off with a goal from Brendan Egan with an assist from Van der Heyde. Loyola scored the next 2 goals, Emmet Reilly found himself all alone in front of the goal for the score. Loyola scored again when Henry Hasenberg scored on an assist from Captain Sean Smith (Connecticut College). Van der Hyder scored an unassisted on an outside shot before Ryder Mora bounced a shot pass the goalie to make the score 8-4 going into the 4th quarter. 4th quarter saw the momentum switch to Loyola. Goals by Jonathan Partamian and Ryder Mora (Maryland) cut the lead to 8-6. Torrey Pines finished the scoring with a goal from Van der Heyde, and goals from Ara Suhadolink and Spencer Small when Loyola pulled their goalie. Face-off’s favored Torrey Pines 14-7. Loyola goalie Joe Theuer was credited with 16 saves while Falcon goalie Max McGuire has 7 for the game. 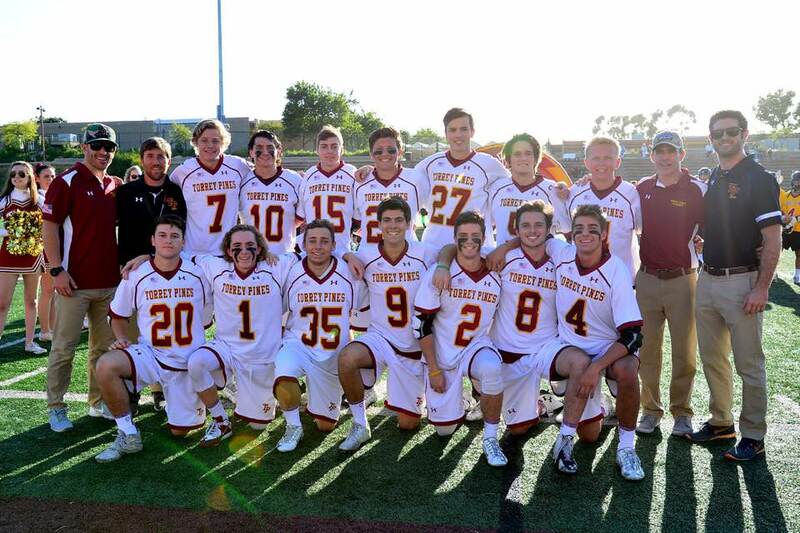 Torrey Pines next travels to Foothill to play the Knights on Friday, April 29. Loyola’s next game is at J Serra on Tuesday, April 26.